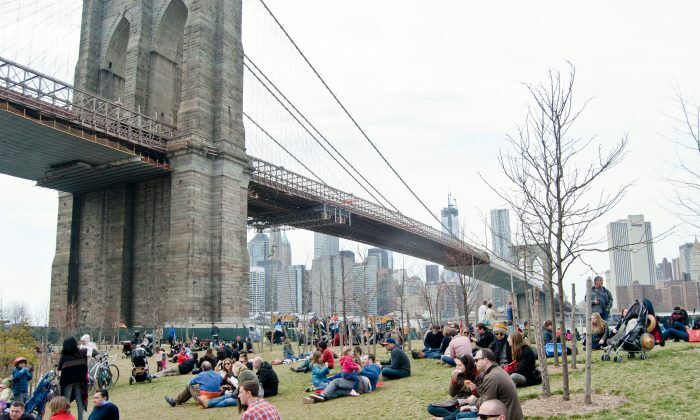 NEW YORK—Heralding the thawing of the city and the arrival of spring as much as daffodils and baseball, outdoor food event Smorgasburg lures foodies out to the park and sit down to a glorious picnic in the sunshine. Carefully curated and notoriously hard for vendors to get into, Smorgasburg opened up its third season in two locations: Saturdays in East River State Park at Kent Ave. and N. 7th Street in Williamsburg, and Sundays in Brooklyn Bridge Park (11 a.m.–6 p.m.). In all, 75 to 100 vendors ply their wares—slow-braised, home brewed, hand-rolled, or deep fried goodness. Smorgasburg merits a careful circumambulation to check out the offerings, but be forewarned. Like any popular event, it is crowded, so moving around is a slow affair, your navigation slowed down all the more by strollers, bikes, and dogs (this is Brooklyn, after all). This also means that you shouldn’t come when you’re ravenous. Not only that, but highly worth the time and just as good as the food (maybe even better), is getting to know the people behind the food. Their passion is palpable, and the food they turn out is unique enough—niche even—you’ll never hear the same story twice. Some are extensions of established restaurants (Mighty Quinn’s had the longest line there at the opening weekend in DUMBO—every single time I peeked); others are pop-up projects. Omar Zerrei, for example, who grew up in Morocco and runs Nadia’s Moroccan Kitchen, named after his ace cook mother, says all his dishes replicate memories from his childhood, from the bastilla—a sweet and savory delicate flaky pastry with a filling unlike anything else, (count all 25 ingredients) and only made at weddings—to rfissa, a braised chicken dish with lentils and onions, only served the third day after a child’s birth. “All these dishes, I guarantee you, if people were to go to a Moroccan traditional restaurant, they wouldn’t be able to get these … These are dishes that just have a dear place in my heart … If i didn’t grow up eating it, I’m not serving it,” Zerrei said. His manner is so warm and fun, his enthusiasm so infectious that you can’t help but feel you’re now part of his extended family too. A dessert he is serving is the orange carpaccio (“we eat a lot of citrus in Morocco,” he said), made with thin orange slices, with orange blossoms, and cinnamon. The interchange of flavors is truly unique, and the fragrance of the blossoms together with the citrus and cinnamon is very heady. At Pit Beef NYC’s booth, Johnny McLaughlin manned the grill, describing his creation—seasoned and charcoal grilled beef round, sliced ultra thin and served on a kaiser roll with white onions and his “Tiger sauce,” a blend of mayo and horseradish. “It’s wrapped for three days, and then it’s open-faced charcoal grilled so it’s nice and rare in the center,” McLaughlin said. If you make it through the throngs of people and the wait, the reward is worth it. New York City is notorious for being a hurried place, but the food here is about care—and that can mean slow, in a good way. When you get to know the vendors, you really start to get a sense of the hours it took to slow braise or coax out the right flavors, or the weeks or months it took to source exactly the right ingredients. Does that knowledge make the food taste better? Without a doubt. Finally, a last word of advice. This is as much a foodie event as a social event. Because there is a lot of either milling around or waiting around, it’s best to come with friends or family. There’s only so much space in your own stomach anyway, and you want to be able to taste a few dishes. So grab a few people whose culinary leanings you like, and get ready to share. Here you’ll find antiques, re-purposed furniture, vintage clothing, jewelry and also plenty of food vendors. Another curated outdoor fair, you’ll find lots of great shopping and great food. The Hester Street Fair’s uptown version, with food only. The city’s greenmarket system includes 54 markets, and over 230 family farms and fishermen. Spanning all five boroughs, over 230 family farms and fishermen participate. You can find prepared artisanal foods as well. See grownyc.org for a full listing.